The Crazy Adventures in the Everyday, Ordinary Lives of the Head Household. I haven't blogged in ages! Too much has happened. My brother got married. That was an awesome time! We are so excitied to have Lacey as a part of the family! We went camping at Caprock Canyon with our friends the Meltons. We hiked, cooked out, and swam at the lake. We ran into quite a few creatures on our trip. The first nite a freindly skunk paid us a visit and helped himself to some Chips and Hot Dog buns. We heard some coyotes that were pretty close to our camp. We saw lots of lizards and the boys had a grand ole time catching grasshoppers. We even saw a couple of trantulas. We had a great time. It is coming that time of year again when we are trying to get organized for the new school year. It seems like we didn't really get a break this year. we got started late last year due to the sweet addition of the Cupcake! Since she wasn't born until September 18th, we didn't get started til October, so we schooled for most of June. I'm a little nervous about the upcoming year. Teaching two children will definitly be a new challenge, but I think with lots of organization, I can do it! I figure it will just take us a little more time to get through it all. Anna Kate is growing like crazy. I couldn't beleive it a few days ago I was searching online for first birthday cake ideas. It went by so quick! Time to start thinking about the next little baby, *wink,wink. She has started trying crawling on all fours now instead of the army crawl. She is also pulling up on the furniture. I think she'll have a fearless streak like her brother, Noah. She tried to go over everything in her way, no going around for this girl, its over the top! Okay, here's Anna Kate's updates! ~ Other names she is most often called by: Sweet Pea, Cupcake, Sugar Pie, and Sugars. You see a pattern? She is just so yummy, and we loved to "eat" on her! ~ She is now 5 months old. She has to be the best happiest baby I've ever met. She cries only if she's hungry. Even when she's sick, she still has a smile. ~ She weighs 13lbs 11 oz. I'm not sure what her length was, but she was in the 30th percentile for both. So, she is smaller than the boys were at this same age, but that's okay. ~ She is totally recovered from her bout with RSV. That was pretty scary, but I'm glad to have it behind us. Just this last week or two has outgrown all the 3 month clothes and is on to the 6mon or larger 3-6 mon size depending on what it is. She has a skinny tummy so the 6mon pants are a little big, but the sleepers are just perfect. ~ Sometime while we were in the hospital, Anna Kate quit using her paci and moved on to sucking her thumb. This is disturbs me greatly. 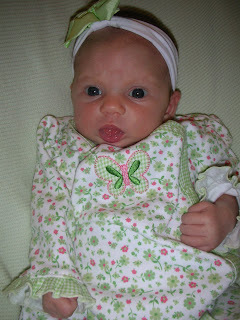 First, it makes me sad because she LOVED her paci, and we have so many really cute ones! Second, thumb sucking is just gross to me, especially as she gets older and is moving around and touches things and gets dirty. The things that could be on her thumb I don't want to think about. Third, when she pops her thumb in, lots of times, her she pokes herself in the eye with her fingers or scratches her nose. Lastly, I can take a paci away from her, but obviously I can't remove her thumb. I also have no support in this matter. Daddy, Nana, and Mimi all think its so super-de-duper cute and no big deal. Daddy even helps her figure out how to get her thumb in there. I am working very hard to get her to take it again. Im hoping that right now, its a habit of convience, and that when she can manipulate putting her paci in her mouth on her own she'll choose the paci. One can hope anyway. ~ She has rolled from her tummy to her back a couple of times on accident, but itsn't fully rolling yet. She can scoot around in a full circle on her back. ~ She loves to play toys now and reaches out and grabs them. Right now her favorite is a little stuffed dolly that her Aunt Ibby gave to her before she was born. She hugs it and rubs her face on it. ~ She sleeps so good at night, most nights until 6am or so. She eats and then sleeps again until 9. I am definitly spoiled! This getting pretty long so I guess I should stop. Boys are in the shower and the Cupcake is starting to wake up. RSV. I really don't know what that stands for but I call it Really Sucky Virus! I do know that it hit my sweet little Cupcake really hard. We spent days just trying to manage her breathing with seemingly no progress. After an ambulance ride on Monday evening when she was is respitory distress, she was admitted to the hospital for 4 days. Thankfully, she does seem to finally be on the mend. We still have another couple of weeks of breathing treatments and cough that could persist for another 6 weeks. She was such a strong little trooper. Everyone on the Pedi floor thought she was the cutest little thing. She was definitly the princess. She smiled at everyone, even the ones who were causing her pain. I brought her all her own blankets. I refused to put her in the gown they gave us. It was brown and orange with tigers on it. So, she hung out in her pink socks, pink hairbow, and we kept her wrapped in her favorite fuzzy blankets. Here's something I learned through this. I have never really been a germaphob. For some reason, though, when Anna Kate was born, I was a little creeped out by germs flinging sanitizer like the best of them. I would make Thomas take off his work clothes as soon as he came home. I was even picky about who could hold her depending on where they had been and what might be on their clothes. I was really cautious about germs and practiced lots of handwashing! And, I really didn't take her anywhere, not even to church. We only went to the essential places and I took the sanitizer with me. Despite all my efforts to protect this little sweet pea, somehow she still became sick. I have never ever doubted that God was in control of my life. However, no matter what I do to control MY world, I am still NOT in charge. I'm not saying God made my baby sick. I think you all know that is not the case. Sickness is just a part of living in this fallen world. Although I will still try to vigilant about hand washing, I will do my best to just trust God to take care of my babies. And, He did! Anna Kate is doing better and will back to normal soon! I waited way too long to blog and there's way too much to catch up on. i'll try to do a brief wrap up and a current "what's happening." The first exciting thing that's happened is my brother is engaged! We are so thrilled and can't wait to make her part of the family. Since she teaches the boys in their classes at church, they call her Miss Lacey and they can't wait to make her Aunt Lacey! They will be getting married on June 11th, Adam's birthday. He should never forget his anniversary, no excuses! We had a fun Christmas with lots of family. Here's a few of the highlights. Anna Kate isn't too sure what all the fuss is about. We went swimming at my parent's hotel. 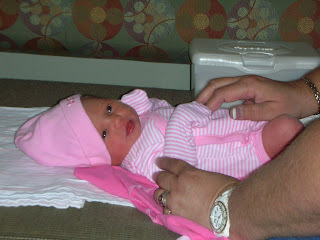 One of the other things I was sooooo excitied about doing was meeting our new neice Parker. She is 7 weeks older than Anna Kate. Tiffany and I had lots of fun playing with each others babies. Since everyone was in town together, we had a double baby dedication. It's also Campaign season again. Tom is running for re-election as County Judge. The Head family as a whole would love and appreciate your prayers! Campain seasons can sometimes be a time of intense warfare and spiritual attack not just against Tom but for the family as a whole. Satan just doesn't like Godly people in leadership. Godly leaders stand for family values and it puts a kink in satan's plan to destroy families. We truly do covet your prayers! Nathan is playing basketball again. This is his second season. He loves competition. He turned 7 just before Christmas and had a party with family and his buddy Trevor at Mr. Gatti's. I can't believe he is getting so big. He loves going to Joyful Heart tuesday school. He's been learning about levers, music, and doing lots of art projects. Noah is still on some restrictions while his arm is growing and healing. He still has a little bit of a curve to his arm but the doctor expects that it will continue to straighten out as he grows. It could still take several more months. We go back for another appointment in early March to see if he will be allowed to play soccer. The curve in his arm makes the bones more apt to break again, but if there is lots of new bone then he should be able to play with the aid of a brace just in case. The other day in the car he asked me, "Mom, can we please go to the park so I can just LOOK at the slide?" This little boy is soo active and it breaks me heart to see him slowed down. I am still pretty nervous about another break. I try not to let it show, but Noah knows I worry. If he falls down in another room, he comes and tells me. "Mom, I feel down, but it was soft and I'm okay." Such a sweet heart. Anna Kate is 4 months old today. She is the joy of our home these days. She giggled for the first time a couple of days ago. Now, everyone is making a fool of themself making silly faces and goofy talk to get her to do it again. She doesn't go for her check up for a couple more weeks. I will post more of her updates when I get her weighed. Until then, here's a peek at the Cupcake. Don't you just want to eat her up? I sure do! Everyone starts with that I think. Everyone says it, but it really does go by fast! I almost don't remember what life was like with out her. She has easily slipped into our everyday lives and activites. She has been a major trooper. She hit her first soccer game at 8 days old and hasn't missed one yet. I take her along in the sling and she just snuggles in and falls asleep. To be honest, I thought going from 2 to 3 kids would be a MAJOR adjustment and I was a little nervous about it. No more tag-teaming the boys with daddy. The kids now outnumber the adults. However, it has been pretty much a breeze. It also helps that she is a super good baby and a really good sleeper. It's been a couple years since we had a little one in our house,but the how-to's came right back. Nathan and Noah are in love with their baby sister. The adore her more than I ever thought they would. Nathan is so proud and wants to hold her all the time. He thinks he is big enough to carry her around and doesn't want to hold her cradle style, he wants her up over his shoulder so that he can pat her back. Yesterday at his Tuesday school, he wanted to show her to his friends and just reached up and took her from me and wanted to walk around with her all by himself. Noah did pretty good with the adjustment. He was a little extra weepy, but nothing that a little extra rocking and cuddling didn't fix. He cannot stop kissing his baby sister. He loves to give her her paci and likes rubbing the back of her head when I'm feeding her. He's very protective. Daddy is already has a little soft spot for her. He loves to cuddle with her at night while she's sleeping. He stays up late just rocking her. His comment? "she's a princess, she needs to be spoiled" He's also super awesome about changing diapers for me in the middle of the night, and has never complained once. Me? I'm having a grand ole time dressing her up and putting bows on her and wrapping her in matching blankets. I put a bow on her everyday whether we are going out or not, even if we just stay home and she stays in a gown all day. ~ She weighs just over 7 pounds. doesn't care if it sprays in her face, she just closes her eyes. ~ She has started smiling a lot and tries really hard to coo. Im sure there's lots more things, but that's all I got for now. So my sweet little Anna Kate has finally arrived! I just finished giving the sweet pea a bath. Can you smell her? I love the smell of babies just after they've had a bath. I thought i would try to get in a quick post and picture before I go to bed, for when baby sleeps, mama should be sleeping too! Last week on Tuesday morning a day shy of 37 weeks, I thought for sure that I was in labor, having regular contractions. My mom ditched jury duty picked up my sister and headed over. I spent the morning doing some last minute toilet scrubbing, dishes, and packing my bag. Around lunch time, we headed to the hospital. Turns out I wasn't having regular contractions, just really painful ones. They did some blood work, gave me shot of morphine and phenergan for pain and to help me relax, and would then be heading back home. The results of the blood work showed that i might have had pre-eclampsia (high blood pressure). I would spend the night to get monitored and do some more tests. Those tests showed that my kidneys were in distress from high blood pressure so I was scheduled for an amnio. My liver and kidneys were like a ticking time bomb is what dr. D said. I won't lie, I was freaked out about doing the amnio and barely slept that night. When they did the ultrasound, the doctor found that I had very little amniotic fluid and the placenta was giving out. I was scheduled to be induced the next morning. Friday morning, I headed in to L&D. Pitocin is not a very nice drug. It's really pretty mean. After getting a really great epidural, my boys came in to see me. We gave them each a Nientendo DS that we had been saving for delivery day for months. We wanted them to have something fun to do to while away the hours. However, they were not long gone from the room, before I was in pain again. My nurse decided to see how far along I was and to maybe try pushing. I told her to call the Doctor first. She said, ummmm, ok, I can do that. She came back, asked me to push once, then said. Don't push anymore. I can deliver a baby by myself, but I would prefer your doctor to be in the room. She walked out of the room and said a little more forcefully, "call her dr back and tell her to get here NOW!" I was scared to death she wasn't going to make it. My nurse assured me I would be fine that she had delivered babies by herself more than once. A few minutes later, her heart rate started dropping. She was probably laying on her chord. We were going to have to get her out soon with or without the dr. Just then, Dr. D walked into the room. I started crying; I was so relieved. A minute later she had arrived at 11:27 am on September 18th weighing in at 5lbs 15 oz and 18 1/2 inches long. I had a pretty strong reaction to the epidural after labor. I couldn't get out of bed for about 12 hours. I had no body control. I spent two more nights in the hospital. After 6 total days in the hospital, we were finally able to all be together again. Man, I missed my boys. She loves it when her brothers sing to her. She always quiets down when she hears them. She likes to be swaddled up tightly. She doesn't seem to cry about too much except when we undo her to change her diaper. She doesn't like to burp. She's too much of a lady her daddy says. Life lately, has been, well, running a pretty quick pace! For those of you who didn't already know. 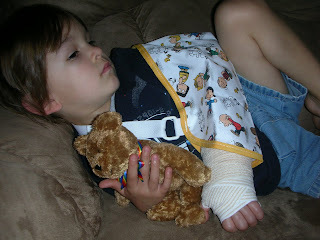 On Sunday evening, Noah somehow fell off my bed and broke his arm. Actually, he broke both of the bones in his left arm. It was a clean break on both bones and nothing had to be set. It was very scary for me. I was home with the boys and Thomas was at work. I knew there was no way I could drive, support Noah's arm, and get Nathan there too. I called 911. Course, i was a little panicked too. I was very proud of my Nathan. He did such a good job of finding shoes for all 3 of us, grabbing Noah's favorite blanket, and then standing the front yard and waving down the ambulance. Of course, Nathan wasn't allowed in the back of the ambulance, so I had to let Noah go with the guys by himself while I followed with Nathan in the van. It was VERY hard for me to let Noah go. I asked him if it would be okay if he went all by himself with the guys for a ride to the hospital and that mommy would be right behind. 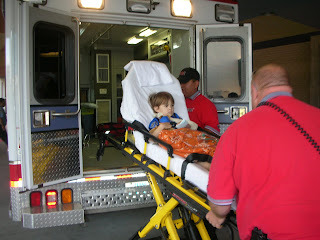 He said, "Umm, yeah, that's ok." Course by the time EMS had arrived, my little tough guy wasn't even crying anymore. He was definitely in shock though, because he was a little weak, very pale, had a low pulse, and they had to give him a little oxygen on the way to the hospital. The EMT gave him a little bear, that Noah named Fireman. But on arrival, this is how he looked. Not scared at all, like it was something he'd done before. 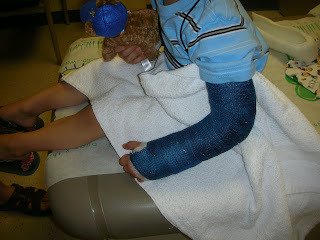 At the hospital they put a soft splint on his arm to allow the swelling to go down before a hard cast was put on. I spent the next couple of days following him around trying to make sure he was staying safe and didn't injure it more. I caught him jumping from my bed, doing a headstand on the couch, running across the couch and jumping to the recliner and then to the floor. The boy wore me out!! 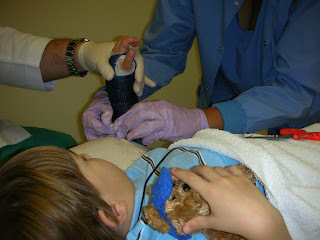 On Wednesday, Noah went to the pediatric orthopedic doctor. I was very nervous for him. I was afraid it would be painful for him. He gave him a good dose of his Tylenol codeine about an hour before hand just in case. He was a little nervous too I think. We had told him that we would be going to the doctor to see how his arm was healing. He told me that morning that, "mama, if somebody messes with me its going to make my arm sting." It was way worse for me than it was for him. At one point, Noah said, "ow,ow,ow." Daddy asked him, what hurts buddy? Noah said, " the doctor is hurting my hair." The doctor had rested his elbow on the side of his head and was pulling his hair. haha! After that appointment, we attended Governor Rick Perry's grassroots campaign rally an Market Street United. People, we are truly BLESSED to have this man leading our great state of Texas! 1000 people a day are moving into our great state. That's it for my soap box for now. Noah got to have Gov. Perry sign his cast. I know he doesn't understand now, but he will have a cool story to tell when he's older. His picture also made the front page of the Lubbock paper. On Tuesday, Nathan started Joyful Heart Tuesday school for homeschoolers. They do Geography, Science, Art, Music, PE, and lots of other fun stuff. He goes from 9-3. For his mama, it was a sad day. I had never left Nathan anywhere before other than with a grandparent or at church. He had never attended a PDO or preschool anywhere. He did have a lot of fun. He told me when he got home that he really loved going to Tuesday school better than he loved to play the Wii. haha! that kid is obsessed with video games. He did however have one little mishap at school though. Somehow he ended up going with the wrong group and attended Music class twice and missing out on geography. He told me, "mama, i was an orange that got mixed up with the blues" haha! i think maybe the blue class had more boys in it. Thursday morning I had a doctors appointment. Anna Kate is still doing good and I am moving along good the Dr. said. I am still so glad that I don't have to worry about having surgery anymore. Dr. D cheered and praised the Lord for answered prayers with me! I feel so blessed to have a Dr. that believes in healing and beseeches the Lord on my behalf!!!! I have about 4 1/2 weeks to go. I am actually crossing my finger though for September 25th. Both boys were born 2 weeks early on a Friday, and that is about 12 days early on Friday. It would just work out best for Thomas's work schedule and for my mom to be able to be free to be in the delivery room with me. So, you hear that little one! September 25th! I am definitely ready for her to be here. Thursday evening Nathan had his first soccer practice for this season. This year he will be playing with more kids and on a bigger field. And, from what I hear, it starts getting much for competitive between the teams. Poor Noah was set to play his first soccer season this year. He obviously can't participate. Nathan's coach has adores little Noah and says that Noah can help him coach Nathan's team and can work out with the big boys some. Noah thinks he's pretty important. I'm excited to watch Nathan play this year. Hopefully, I won't have to miss too many games due to Anna Kate's arrival. I bought a sling to put her in at the games and I don't plan on letting anyone mess with her or passing her around.